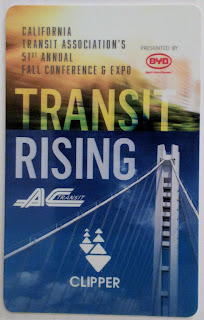 TransportiCA: Thank You AC Transit for the CTA conference collectible Clipper Card! Thank You AC Transit for the CTA conference collectible Clipper Card! TransportiCA is very thankful for AC Transit's being the agency host for California Transit Association's 51st annual fall conference and exposition. AC Transit provided all attendees a beautiful and collectible Clipper card, for use on AC Transit, BART and other transit providers. Again, THANK YOU AC Transit for providing these wonderful Clipper cards to attendees during CTA's annual fall conference.